Las Vegas | Do You Hear The Music? Huntington Beach where you at?! The countdown to Life is Beautiful 2016 rolls on and pretty perfect for today! Check out this stripped down version of “Moon Tower” by Dirty Heads off their self titled, fifth album which dropped earlier this summer. 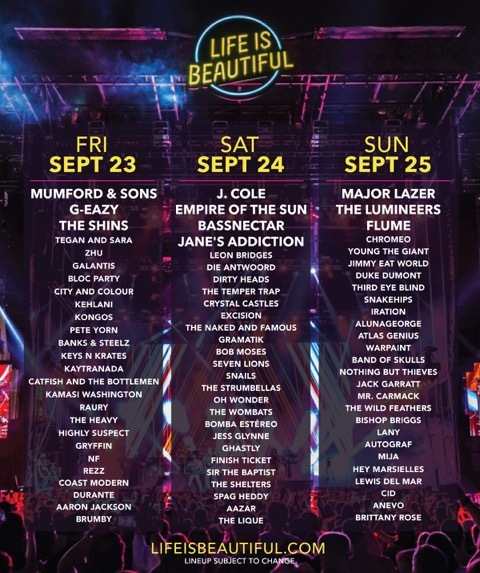 Getting stoked to have the fellas perform at Life is Beautiful on Saturday, September 24. More here from Relix. “Do you remember…….” Welcome to September and welcome to Life is Beautiful month! We’re going to kickoff this countdown with a dance party thanks to the funkiest duo around, Chromeo! Get amped and get ready to catch them performing in DTLV on Sunday, September 25! 2016 continues to be a year of mourning in the music industry and this one, personally hits hard as Sir George Martin has passed away at the age of 90. The “fifth Beatle” as he was widely referred to died “peacefully at home” according to reports. The producer of the Beatles and the man who helped bring their sound to life was a pure genius and regarded as one of the finest and most intelligent people in the business. I encourage you to take some time today to learn a bit more about Sir George Martin and the impact he’s had over his lifetime. For me it obviously began with my parents playing The Beatles music growing up and continuously being surrounded by it. Then it was 10 years ago in Las Vegas when Cirque du Soleil announced a collaboration for The Beatles LOVE by Cirque du Soleil and having a chance to sit through dress rehearsals and media days (I was assisting on the PR end as the company I worked for handled PR for Cirque) and listen to how the soundtrack for the show came together and how Sir George Martin worked with his son Giles to put together one of the most incredible arrangements I had ever heard. This was also the time when Apple Corps didn’t own the original catalog of The Beatles’ music, Michael Jackson did and so the two Martin’s were using outtakes, other recordings, etc. and still delivered an amazing 90 minutes of music for Cirque du Soleil to perform with. Then in 2014 I had a crazy idea, could I bring together my favorite show, The Beatles LOVE by Cirque du Soleil and the Las Vegas Philharmonic Orchestra for a first time performance at Life is Beautiful? This wild pipe dream became a reality thanks to Giles Martin and the team at Cirque du Soleil and of course the LV Phil. Giles rewrote the score for this 30 minute performance and it was an incredible moment and one that I will never forget. We lost a legend. A man who not only changed the way we listened and fell in love with music but also a man who was regarded as one of the best. We lost a Beatle today. May you rest in peace Sir George Martin. Vegas’ own, The Killers, are back with the 10th installment of their annual Christmas tune with the 2015 addition, “Dirt Sledding.” More words can be found HERE via Rolling Stone. Now that the festival has passed I am digging back into the internet for some new tunes and some possible artists for next year’s lineup. But, before I start posting like a wild fire, I’m even more excited for this collaboration featuring 2013 Life is Beautiful performer Joey Bada$$ and 2015 LIBers Glass Animals. I never would have seen this coming but I guess I shouldn’t be too surprised either after learning the artists had gotten together back in 2012. Fast forward a few years and voila! It’s got those funky, psychedelic beats of Glass Animals lingering at the beginning of the track but layered on top is a ferocious Joey Bada$$ with some beats that remind me of back in the day Timbaland. All I’m saying is give a listen and put on repeat. Hellooooooo Vegas! 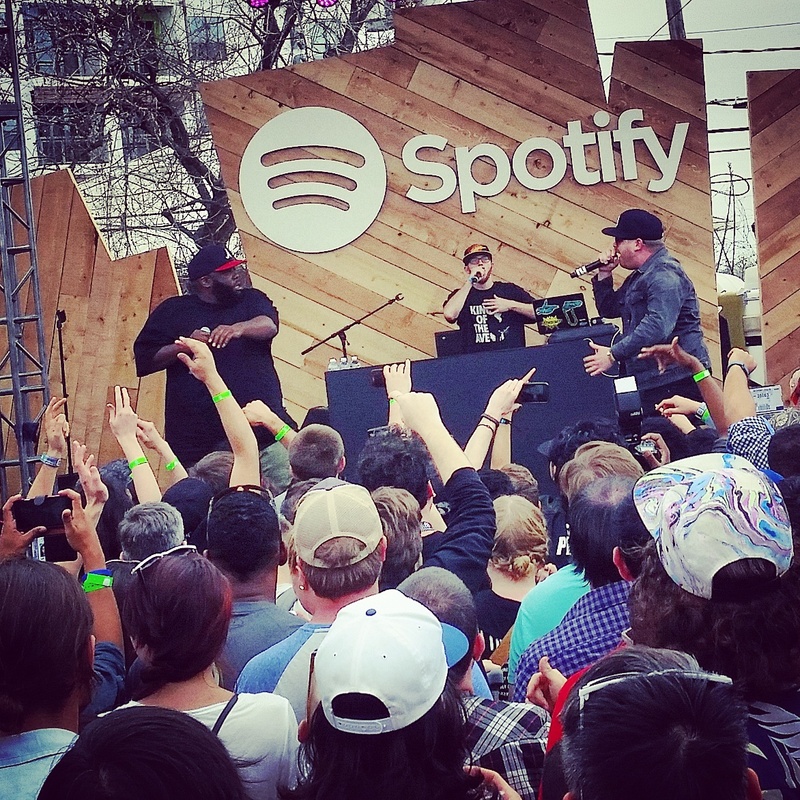 Run The Jewels = if you’ve never seen Killer Mike and El-P live, you’re missing out. Good thing we’re going to fix that for you on Sunday, September 27 at 7:55pm on the Ambassador Stage at Life is Beautiful. The duo just appeared last night on the Late Show with Stephen Colbert, last weekend performed in the UK at Banksy’s Dismaland Bemusement Park (p.s. Banksy is coming to the festival!) and for the last two years have been simply, on fire! To give you a taste of what to expect, here’s their performance from Bonnaroo this past summer. Here’s a photo I snapped at SXSW this year. So good! Yep, 10 days out! It’s the homestretch and today’s featured artists are Rebelution, SOJA and The Green because this is the first year we have featured reggae at Life is Beautiful! As a reggae fan I’m stoked on this and definitely going to be feeling the good vibes when these three bands take the stage at the festival. It’s gonna be hot, the sun will (hopefully) be shining and the drinks will be flowing.